Does Mayhem Devil "see" itself if it is sacrificed? They aren't sacrificed nor destroyed. They are put from the battlefield into the graveyard (so it does count as dying). You can't chain Eldritch Evolution because it gets exiled. Veteran Explorer is an interesting idea, but I'm sceptical. Giving your opponent lands leverages the advantages you gain by cheating on mana, and since it isn't a mana dork by itself, it doesn't allow you to cast Evolution on T2. This one seems very interesting, despite being 3 mana. Works well with treasures (Standard-relevant, for those who care), punishing opposing fetches/Wastelands and turning your own copies into pingers alike, and buffs sacrifice effects of your own, like Liliana Ultimate or Cataclysm. Isn't that also Anti-Emrakul tech to deal the last few points of damage? Could be brutal with Cataclysm. But I prefer Greater Gargadon. Either way, pick these up boys. It is going to have value as a casual staple for years to come and is bound to be big in Standard. Honestly, I wouldn't be surprised if that thing showed up in Legacy sooner or later. Decent body, still reasonably costed, adds reach and can mow down small creatures and Planeswalkers alike. Looks like a great midrange card in my books. Nicol Bolas wins, and his greed makes him say he's leader of all guilds. Jace, as living guildpact, therefore can pass a law that says Bolas loses. Bolas is obligated to obey, multiverse saved. I'll get you next time, gatewatch! And I woulda got away with it too, if not for you snooping kids! Judith triggers on sweepers and is a lord. Apples and oranges. Zombardment definitely comes into mind with this card. 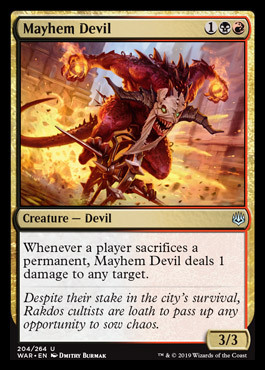 This guy triggers on fetches and wastes also which isn't nothing. Judith is probably less build around because it's just a dies ability, but this guy I feel like has a ton of perennial if you decide to build around him a bit. Also Judith being legendary is a drawback in a format of Karakas. At the end of the day, why not both? Judith is way better than mayhem devil in zombardment and she isn’t even good there. Both are quite win-more. If you’re able to activate goblin bomardment multiple times you probably win. 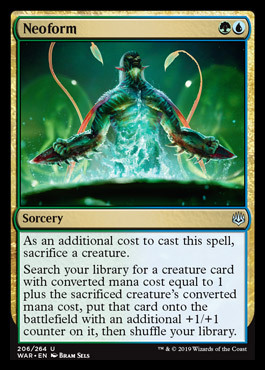 Also, "additional cost" creatures like Skaab Ruinator, conditional ones like Myr Superion or Sera Avenger, creatures with +1/+1 counter synergies like Arcbound Ravager or Incubation Druid and oddities like Epochrasite.